A local home is at the center of an international espionage case. HEDWIG VILLAGE, Texas (KTRK) -- Seven people, most from the Houston area, are accused of trying to steal trade secrets in a wide ranging case of alleged corporate espionage. 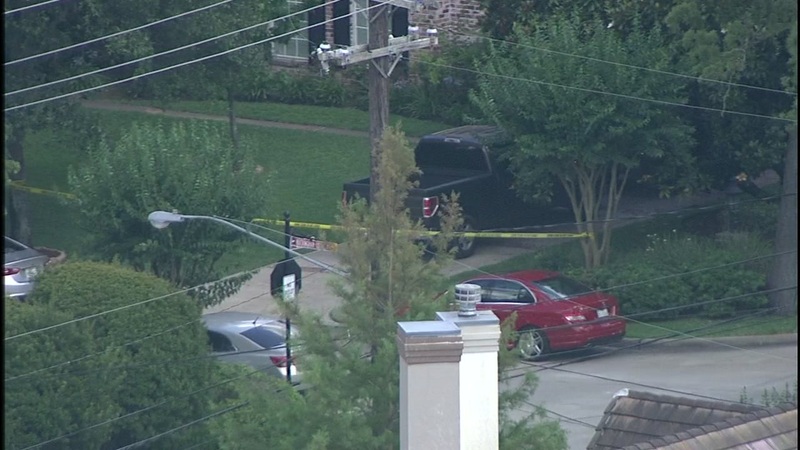 The criminal complaint was unsealed Wednesday, but neighbors first noticed something wrong on Tuesday morning, when FBI agents converged on a multi-million dollar house in Hedwig Village -- an upscale enclave in Houston. Their focus was the home where Shan Shi and his family lived. "I see this girl wearing an FBI t-shirt and I thought, 'it's graduation, and someone's having a costume party,'" said Mary Kay Fruth, who lives three doors down from the Shi family. "I got out my binoculars and was trying to see what was written." In reality, the allegations are wide ranging and shocking. Federal investigators say Shi, along with six others, tried to trade secrets from a business in the U.S. on behalf of a company in China that was engaged in manufacturing a high-performance, naval-grade product for military and civilian uses. Prosecutors allege Shi used his companies CMB-International Inc. and Deepoil.com as fronts to gather trade secrets and pay others. ABC13 spoke to several family members who were present in the large Hedwig Village home in Chinese. The relatives would not elaborate on the accusations made by the U.S. government and proclaimed to "not know anything." The FBI and several other federal government agencies are carrying out a raid on a Hedwig Village home, authorities confirm. Besides Shi, 52, of Houston, the FBI also arrested Uka Kalu Uche, 35, of Spring; Samuel Abotar Ogoe, 74, of Missouri City; and Johnny Wade Randall, 48, of Conroe. Kui Bo, 40, a Canadian citizen and Gang Liu, 31, a Chinese citizen, were also charged. Another person, Hui Huang, 32, living in China, was also charged. Investigators said he works for the Chinese manufacturing firm that allegedly gathered information from employees of the Houston company. Prosecutors said Shi and his fellow defendants systemically tried to steal the trade secrets of a global engineering firm and the syntactic foam it made. The foam, a strong, light material that can be tailored, is mainly used in marine and military applications. Shi and another defendant would recruit employees who worked for the specific multi-national company, investigators said. Although federal investigators did not name the multi-national company, several of those charged have worked at Trelleborg, a multi-national company that happens to make a version of syntactic foam. "We have talked to them, spoken to them, they have children (our kids) age, so our children have played together a little bit," said neighbor Wade Stockstill, who also happens to work in the oil and gas field. Stockstill said the allegations sound all too familiar, because trade secret theft is a large problem. "It happens all over the place. In oil and gas, it's very prevalent and I'm just glad to see the government is doing something about it," he said. Stockstill admits he's still shocked that his neighbor is accused of such a crime. The FBI has also filed court papers to seize the multi-million dollar Hedwig Village home, as well as office space belonging to Shi's company in northwest Harris County. The maximum penalty for a person convicted of conspiring to commit theft of trade secrets is 10 years in prison and potential financial penalties. This particular case is being investigated by the FBI Houston office, but prosecutors are based in Washington, D.C.